Access and configure the advanced adapter settings to meet your wireless networking needs. Right-click Start in the bottom left corner. Click the > sign to expand the Network adapters entry. Right-click the wireless adapter and click Properties. Click the Advanced tab to configure the advanced settings. Click Device Manager (located in the top left of screen). Right-click the My Computer icon on the desktop or from the Start menu. Click the + sign to expand the Network Adapters entry. Note Certain properties may not appear depending on the type of wireless adapter, driver version, or operating system installed. Allows you to select whether the adapter operates in the 802.11b, 802.11g, and 802.11a bands. 802.11a only: Connect the wireless adapter to 802.11a networks only. 802.11b only: Connect the wireless adapter to 802.11b networks only. 802.11g only: Connect the wireless adapter to 802.11g networks only. 802.11a and 802.11g: Connect the wireless adapter to 802.11a and 802.11g networks only. 802.11b and 802.11g: Connect the wireless adapter to 802.11b and 802.11g networks only. 802.11a, 802.11b, and 802.11g (default): Connect to 802.11a, 802.11b, or 802.11g wireless networks. Note To enable 802.11n/ac, keep the default setting for Wireless mode. Select HT mode for 802.11n, or VHT mode for 802.11ac under HT mode. The setting lets you select 802.11n High Throughput mode (HT Mode), 802.11ac Very High Throughput Mode (VHT Mode), 802.11ax or disable 802.11n/ac/ax modes. Default value maybe 802.11ac or 802.11ax depending on the adapter you have. The 802.11n standard adds multiple-input multiple-output (MIMO). MIMO increases data throughput to improve the transfer rate. Use the setting to enable or disable high throughput mode support (MIMO - 802.11n). For other newer adapters, HT Mode or 802.11n/ac Wireless Mode replaces this setting. To achieve transfer rates greater than 54 Mbps on 802.11n connections, you must select WPA2-AES security. You can select no security (None) to enable network setup and troubleshooting. An administrator can enable or disable support for high throughput mode to reduce power consumption or conflicts with other bands or compatibility issues. Use channel width to set high throughput mode channel width in order to maximize performance. Ad-hoc channel 802.11 b/g is the band and channel selection for device to device (ad-hoc) networks. You don't need to change the channel unless the other computers in the ad-hoc network are not using the default channel. 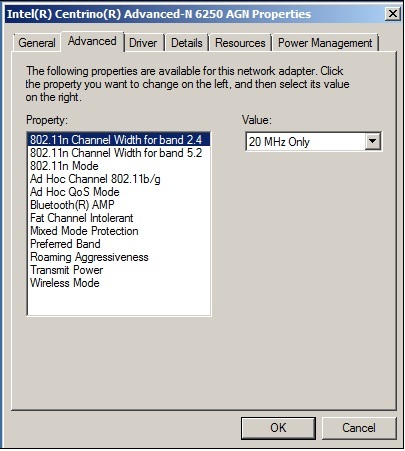 802.11b/g (default): Select when using 802.11b and 802.11g (2.4 GHz) ad-hoc band frequency. 802.11a: Select when using 802.11a (5 GHz) ad-hoc band frequency. Set power-saving features for device to device (ad-hoc) networks. Disabled: Select when connecting to ad-hoc networks with stations that don't support ad-hoc power management. Maximum Power Savings: Select to optimize battery life. Noisy Environment: Select when connecting in a noisy environment to prevent performance degradation. The Quality of Service (QoS) control in ad-hoc networks prioritizes traffic from the access point over a Wi-Fi Local Area Network (LAN) based on traffic classification. Wi-Fi Multimedia* (WMM*) is the QoS certification of the Wi-Fi Alliance* (WFA). When WMM is enabled, the adapter uses WMM to support priority tagging and queuing capabilities for Wi-Fi networks. Note This setting isn't available on Windows® 10. ARP offload is the network adapter's ability to respond to an IPv4 ARP request without waking the computer. To enable the feature, both the hardware and the driver must support ARP offload. Enable or disable Bluetooth® AMP. Alternate MAC/PHY (AMP) uses the 802.11(Wi-Fi) as the high-speed transport. If disabled, Bluetooth HS is turned off. The setting communicates to surrounding networks that the Wi-Fi adapter isn't tolerant of 40 MHz channels in the 2.4 GHz band. When disabled the adapter doesn't send this notification. By default, the Wi-Fi adapter will perform periodic scan for other available Access Points (AP). Disabling this behavior can be helpful when using application software that is sensitive to brief interruptions in network connectivity. Always: Will not perform periodic scans for other available APs. Never (default): Will perform periodic scans for other available APs. On Good RSSI: Will only perform periodic scans for other available APs when the current AP’s signal strength is low. Note It is not recommended to change this setting for users who are mobile throughout the day. Group Temporal Key (GTK) Rekey is used to encrypt and decrypt network traffic. MIMO power save mode MIMO power save mode, also known as spatial multiplexing power save (SMPS) mode, allows the client to save power by keeping one antenna in a receive idle state. Auto SMPS (default): The client decides automatically what SMPS mode to apply depends on different conditions. Dynamic SMPS: The client keeps only one antenna active. The access point (AP) must send request to send (RTS) packet to trigger the client to wake the sleeping radios/antenna before sending MIMO packets. Static SMPS: The client keeps only one antenna active and the AP cannot send MIMO packets to the client. No SMPS: The client always keeps all antennas active and the AP can send MIMO packets to the client. Note Some legacy APs may have compatibility issue with supporting the SMPS mode and may cause various link quality problems such as low throughput. Change this setting to No SMPS may help to work around the issue. Use mixed mode protection to avoid data collisions in a mixed 802.11b and 802.11g environment. Use Request to Send/Clear to Send (RTS/CTS) in an environment where clients may not hear each other. Use CTS-to-self to gain more throughput in an environment where clients are within hearing proximity. Note The setting isn't valid when 802.11n mode is enabled. NS offload is the network adapter's ability to respond to a Neighbor Discovery Neighbor Solicitation request with a Neighbor Advertisement without waking the computer. Both the hardware and the driver must support NS offload to enable this feature. Enables power saving by reducing the number of receive interrupts. The feature reduces receive interrupts by coalescing random broadcast or multicast packets. Preferred band In an environment with other radiating devices nearby (such as microwave ovens, cordless telephones, access points, or client devices), in order to reduce interference, you may prefer the 5GHz band over the 2.4GHz band, or the reverse. This setting alters the signal strength threshold at which the WiFi adapter starts scanning for another candidate AP. The default value is Medium. Depending on the environment, one option may work better than the other. You may try other values to see which works best for your environment. However, it is recommended to revert back to the default (Medium) if no improvement is observed with other values. 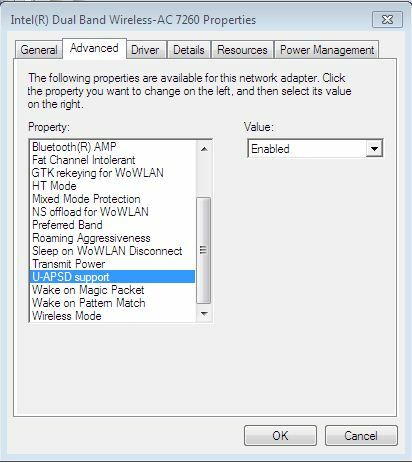 Lowest: The WiFi adapter will trigger scan a for another candidate AP when the signal strength with the current AP is very low. Highest: The WiFi adapter will trigger scan a for another candidate AP when the signal strength with the current AP is still good. Sleep on WoWLAN Disconnect is the ability to put the device to sleep/drop connection when WoWLAN is disconnected. Enhance the transmit throughput by enabling packet bursting. When this setting is enabled and the client (Wi-Fi adapter) has buffered enough data, the client is able to hold longer possession of the air medium than it normally does to send the data to the Access Point (AP). This only improves the upload throughput (from client to the AP) and is mostly effective for usages like uploading large files or upstream benchmarks. Note In a Wi-Fi network only one client can transmit at a time. So the throughput for other clients in the same network may be negatively impacted when this feature is enabled. The optimal setting is to set the transmit power at the lowest possible level still compatible with communication quality. The setting allows the maximum number of wireless devices to operate in dense areas. It reduces interference with other devices that share the radio spectrum. If you decrease the transmit power, you reduce the radio coverage. Lowest: Sets the adapter to the lowest transmit power. Increase the number of coverage areas or confine a coverage area. You should reduce the coverage area in high traffic areas to improve overall transmission quality and avoid congestion or interference with other devices. Medium-low, Medium, or Medium-high: Set by country requirements. Highest (Default): Sets the transmit level of the adapter to a maximum. Use this setting in environments with limited radio devices for maximum performance and range. This setting takes effect when either Network (Infrastructure) or Device to Device (ad-hoc) mode is used. U-APSD (or WMM-Power Save or WMM-PS) is a Wi-Fi capability that saves power consumption on low periodic latency-sensitive traffic modes, like a VoIP. We have identified interoperability (IOT) issues with certain access points that result in reduced RX throughput. If enabled, the setting wakes the computer from a sleep state when it receives a Magic Packet from a sending computer. The Magic Packet contains the MAC address of the intended destination computer. Enabling turns on Wake on Magic Packet. Disabling turns off Wake on Magic Packet. It only disables the Magic Packet feature, not Wake on Wireless LAN. Disabling only disables the pattern match feature, not Wake on Wireless LAN. This article applies to 44 products.